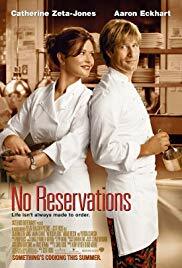 No Reservations is a 2007 American romantic comedy-drama film directed by Scott Hicks. Starring Catherine Zeta-Jones, Aaron Eckhart, and Abigail Breslin, the screenplay by Carol Fuchs is an adaptation of an original script by Sandra Nettelbeck, which served as the basis for the 2001 German film Mostly Martha, and revolves around a hard-edged chef whose life is turned upside down when she decides to take in her young niece following a tragic accident that killed her sister. Patricia Clarkson, Bob Balaban, and Jenny Wade co-star, with Brían F. O’Byrne, Lily Rabe, and Zoë Kravitz—appearing in her first feature film—playing supporting roles.